the set will be in the shop next week. doll list continued, All Mine! so Adorable! I just love your wonderful creations. Oh, they are just wonderful! Oh, how cute! I’ll definitely be checking in. Love them all…I WILL be back! Thank you for sharing your talent! Love Love Love them! I can’t wait. Some of my favorites so far!!! Oh the cape! I can’t wait. 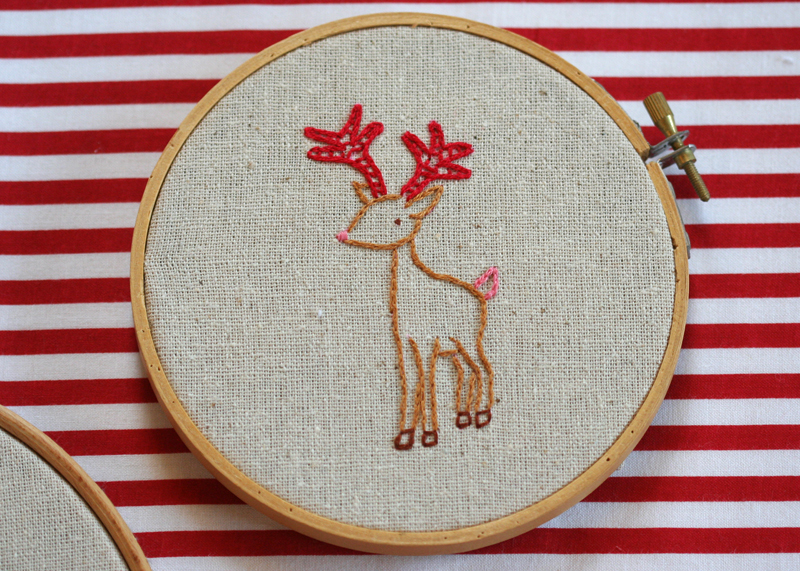 The wee deer is perfection! Way too cute…will be ordering one soon! Oh, just perfect. Love them, I think they’re my favorite so far. Oh my goodness! She is just perfect. You are so very clever. cute. and the striped fabric adds the best touch. Those little gingerbread fellows are C-U-T-E! So sweet! I’m kinda missing the wings, though. The deer is adorable! ooh! holy crap on a cracker. I forgot them!! “Holy crap on a cracker”….you crack me up! In love with the reindeer. So cute. i’m waiting for this to order the gnomes…i think i have every single item you’ve sold and not enough time to make them–one day i’ll get them all made and have a hillary shrine in my craft room!! there it is. 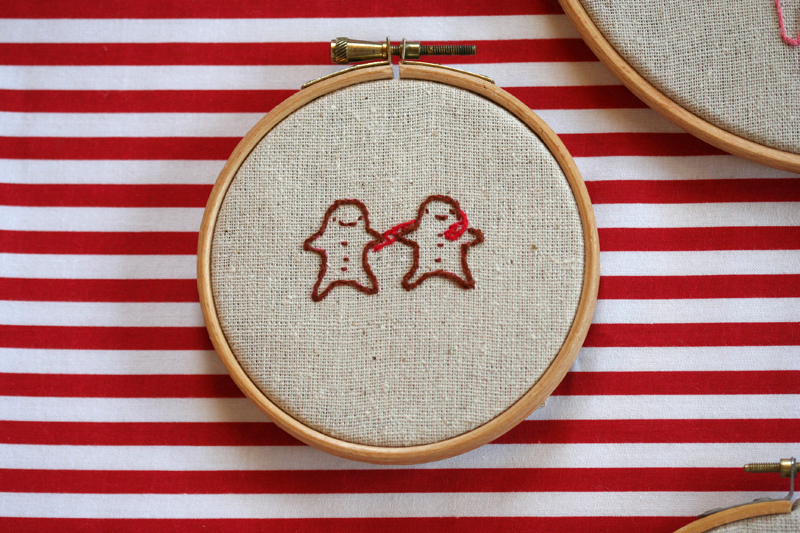 my holiday spirit on fabric! cute. cute. Love her hair and the cheeky gingerbread duo! Merry, merry! These are all so adorable!!! Oh a lovely early present for me! So sweeeeet! I love her! I’ve been wondering what kind of embroidery floss you use for your stichettes. And is that the chain stitch? Your stitches are so delicate and neat. I’m jealous! 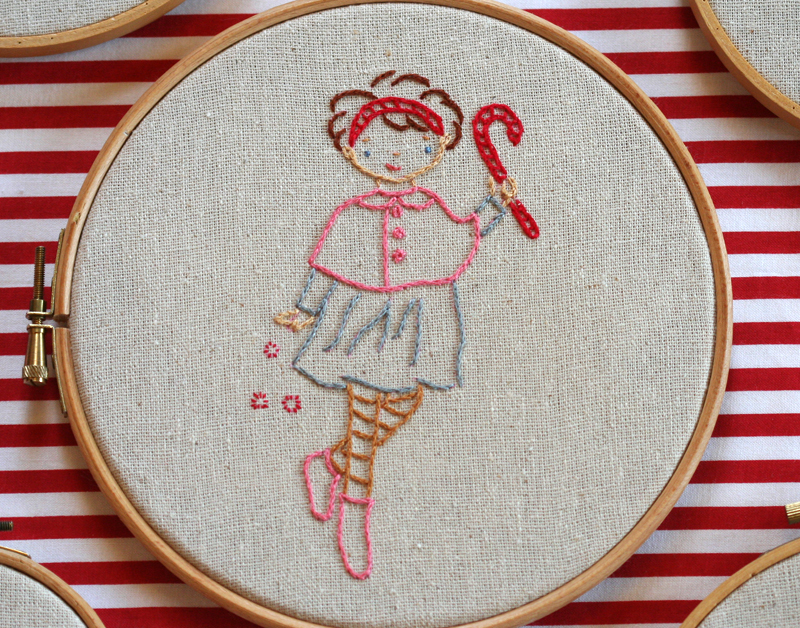 I just want to say how I just love the little girl peppermint stitchette. i visit your blog every day … i love all … but don’t speack english very well ! so in french : j’admire vraiment ton travail, particulièrement les broderie !